People push their physical capabilities to the limit when they’re training which makes it important for them to stay hydrated throughout the session. Drinking water fountains are ideal devices to install to make clean water easily accessible in gyms. They will provide convenience for the person exercising, allowing them to carry on with their routine after they’ve had a sip of the precious resource. Here at Drinking Water Fountains, we understand the importance of having access to water and drinking it regularly. This is why we offer a wide range of drinking water fountains for gyms and sports halls. Your gym can be equipped with the latest indoor and / or outdoor fountains that can either be wall mounted or stand-alone units. All are made from superior quality materials to ensure an exceptional functionality. Studies have shown that people lose more water when they exercise even though they’re not heavily perspiring. This is because water cools down the body, releases toxins, reduces fatigue and recovery time, and generally increases the quality of the workout. There is so much of this resource being used in that relatively short space of time that it needs to be replenished constantly. Drinking from water fountains in the gym will greatly help exercisers do just that. Make your gym workout friendly. 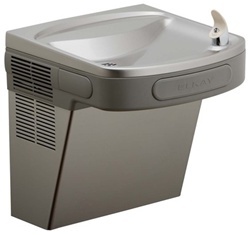 Browse our range of drinking water fountains online and contact us to get the right product for the job today.